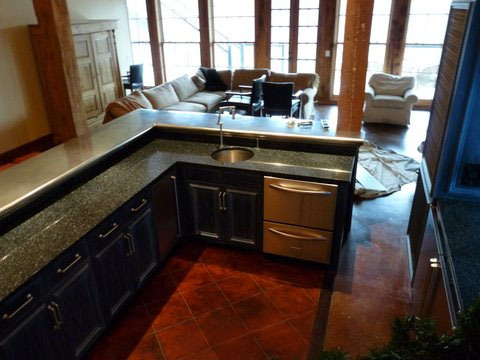 Custom Countertops - #3860 | Handcrafted Metal Inc.
A large island bar with Bistro edge on all sides. This bar terminates at a wall and column at one end. We shipped this extraordinary bar in a single peice, with no seams. To fit the long L shape into a crate that would fit into a truck, we constructed support armatures that allowed us to angle this top and diagonal it inside the crate. 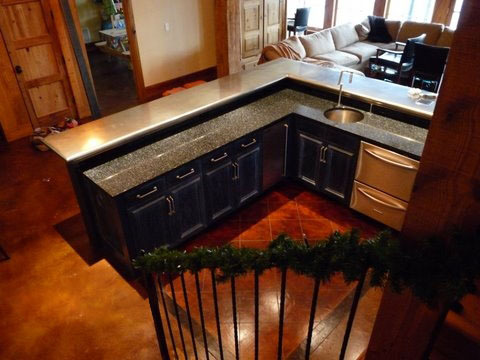 Smooth pewter, semi-gloss finish.